Following extensive flight testing, Gulfstream has demonstrated that the G280 flies 3,600 nm (6,667 km) with four passengers at Mach 0.80 with NBAA IFR reserves. “Demonstrating a 200-nautical-mile increase in range is testimony to both the excellent aerodynamic characteristics of the aircraft and the fuel efficiency of the Honeywell HTF7250G propulsion system,” said Pres Henne, senior vice president, Programs, Engineering and Test, Gulfstream. With its increased range, the G280 can fly nonstop from London to New York or Singapore to Dubai. With just one stop, the G280 can link Las Vegas and London or Las Vegas and Tokyo. In addition to more range, the aircraft offers a shorter balanced field length. Its balanced field length has been reduced from 4,960 feet (1,512 m) to 4,750 feet (1,448 m). This field length is an improvement of more than 1,300 feet compared to the G200 it replaces. 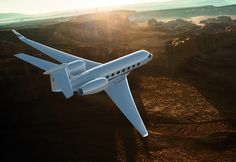 “The G280 will offer unsurpassed mission flexibility for a business jet of this size,” Flynn said. Gulfstream announced the G280 on Oct. 5, 2008, at the National Business Aviation Association (NBAA) Meeting & Convention in Orlando, Fla. The aircraft is powered by twin Honeywell HTF7250G engines, each of which provides 7,445 pounds of thrust. These fuel-efficient engines feature reduced emissions, longer maintenance intervals and decreased noise levels. They also offer excellent climb performance, propelling the G280 to FL410 in less than 20 minutes. The G280 is conducting the final activities required to receive its type certificate from the Federal Aviation Administration, European Aviation Safety Agency and the Civil Aviation Authority of Israel. Already, the three aircraft in the flight-test program have accumulated more than 1,690 hours of flight time over more than 628 flights. A fully outfitted G280 is part of Gulfstream's static display at the NBAA Meeting & Convention in Las Vegas Oct. 10-12. Gulfstream Aerospace Corporation, a wholly owned subsidiary of General Dynamics (NYSE: GD), designs, develops, manufactures, markets, services and supports the world's most technologically advanced business-jet aircraft. Gulfstream has produced more than 2,000 aircraft for customers around the world since 1958. To meet the diverse transportation needs of the future, Gulfstream offers a comprehensive fleet of aircraft, comprising the wide-cabin, high-speed Gulfstream G150®; the new large-cabin, mid-range Gulfstream G280®; the large-cabin, mid-range Gulfstream G350®; the large-cabin, long-range Gulfstream G450®; the large-cabin, ultra-long-range Gulfstream G500®; the large-cabin, ultra-long-range Gulfstream G550® and the ultra-large-cabin, ultra-long-range G650®. Gulfstream also offers aircraft ownership services via Gulfstream Pre-Owned Aircraft Sales®. The company employs more than 11,500 people at 10 major locations. We invite you to visit our website for more information and photos of Gulfstream aircraft at www.gulfstream.com. General Dynamics, headquartered in Falls Church, Virginia, employs approximately 88,000 people worldwide. The company is a market leader in business aviation; land and expeditionary combat systems, armaments and munitions; shipbuilding and marine systems; and information systems and technologies. More information about the company is available on the Internet at www.generaldynamics.com.